Our latest was to the Apartment bar in Belfast where we called in for a bite of dinner after an evening of shopping in Belfast’s city centre. 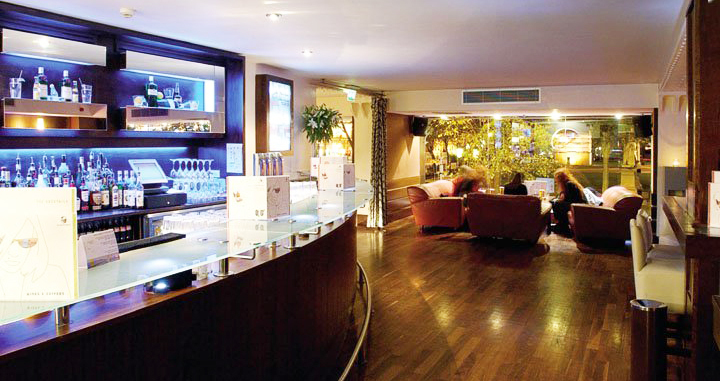 The Apartment has won many awards, including the ‘Bar of the Decade’ at the 2010 FATE Awards. It had been a while since either of us had been in the Apartment and on first impression we were left a little disappointed by the shabby interior, which is now beginning to show its age. The bar was pretty busy but we managed to get a table for two, albeit, not the most comfortable. Despite these initial impressions, the menu looked good and both the food and cocktails were reasonably priced. We placed an order for a crispy duck confit and steak and chips, along with two soft drinks. 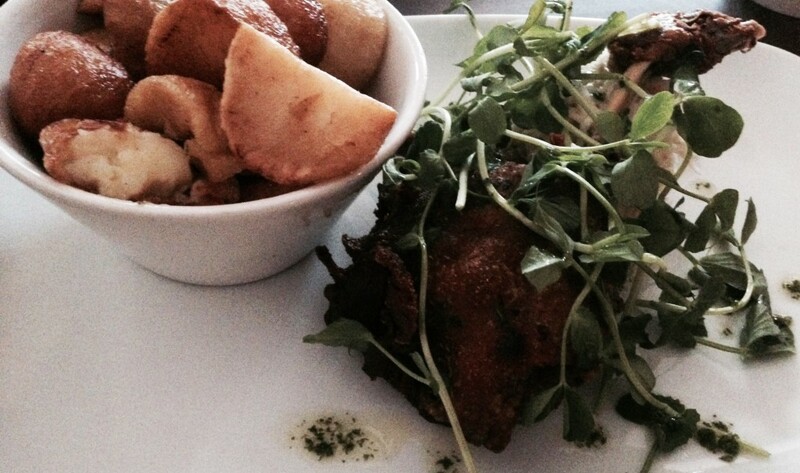 Crispy duck confit with a ginger and celeriac remoulade and garlic potatoes. Helen ordered this main course and absolutely loved it. The duck feel off the bone and the skin was perfectly crisp. The ginger and celeriac remoulade was a new experience and a very tasty one at that. The watercress garnish was a nice touch and the garlic potatoes were crisp and very moreish. Helen felt that the portion size was a tad skimpy but the flavour and overall taste of the dish, more than made up for this. As a lover of steak, I was delighted to see a nice choice of steak types on the menu. I opted to go for the 8oz rib eye steak and had this cooked medium rare. When the dish arrived to the table, I couldn’t help but think it was missing something. It really lacked any theatre and the presentation seemed a little lazy. 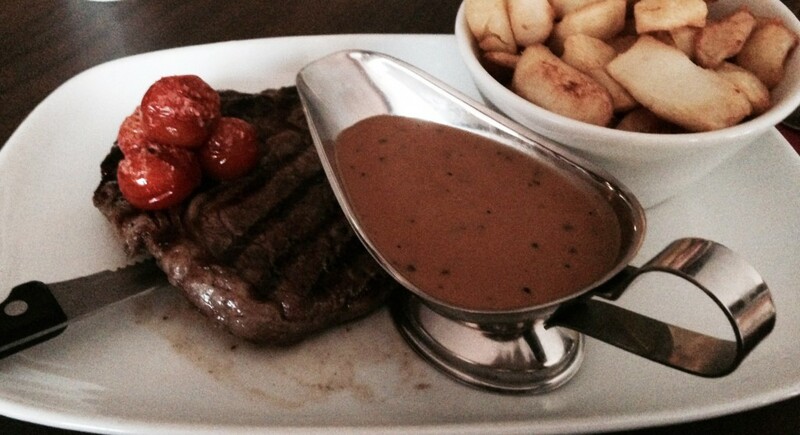 Despite this, I was looking forward to it because it’s steak, chips and peppered sauce – a perfect combination. Too be entirely honest, I was very underwhelmed by the whole dish and in fact, the star of the dish was the chips. The steak was a little tough and although it was cooked to my liking, it lacked taste. On reflection I probably should have ordered a side of onion rings but will know for again. The price was pretty reasonable for a steak dinner but I won’t be rushing back for it. I did however sample a bit of Helen’s duck, which I did rather enjoy. Overall, this meal left us with mixed feelings. We expected more for what we had paid and felt a little let down by the portions and indeed the interior decor of the building. Have you been to the Apartment Bar, Belfast recently for something to eat? We’d love to hear how your meal went and what you thought of the venue. Let us know by commenting below or connecting with our Facebook and Twitter page to share your story.